LAKE FOREST, CA--(Marketwired - Jan 9, 2015) - The dream of homeownership in Orange County is now within reach at El Paseo by Brookfield Residential. This gated new community within the Village of Foothill Ranch is attracting those who want to say goodbye to renting and hello to homeownership. With low prices and the financial benefit of no Mello-Roos fees, renters are excited to learn they now have the opportunity to buy new at El Paseo! For immediate information on priority registration, visit www.BrookfieldSoCal.com. There are many financial advantages of buying a home and recent data proves it. Trulia, one of the top real estate websites, found that homeownership is less expensive than renting in all of the country's 100 largest metropolitan areas, which includes Orange County. The average cost of homeownership in the country was 38 percent lower than renting in 2014, and rent continues to rise faster than home prices. Homeowners can also deduct their mortgage interest on their income taxes, which often results in money back from the government! Rent payments are never tax deductible. "It is especially gratifying when renters visit the sales office and leave as a new El Paseo homeowner," said Mercedes Meserve, Vice President of Marketing for Brookfield Residential Southern California. "El Paseo is not only the most exciting new home opportunity in Orange County, it's the place where renters are becoming homeowners." 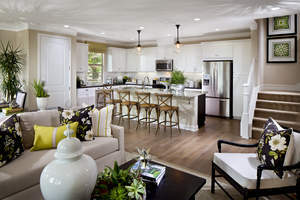 Continued enthusiasm for the stylish new homes of El Paseo have led to new phase releases to meet demand. The combination of the community's affordability, location, low-maintenance living, and home designs has been an instant hit with buyers. El Paseo offers six innovative townhome designs ranging from approximately 944 to 1,792 square feet, with 1, 2 and 3 bedrooms, up to 2.5 baths, and 1 or 2-car garages. Open floorplans offer spacious gathering areas with great rooms and modern kitchens. Covered decks and private patios, per plan, extend the living space outdoors. Pricing for El Paseo's 1-bedroom floorplan starts from the mid $300,000s; 2 bedrooms start from the mid $400,000s; and 3 bedrooms are priced from the low $500,000s. Private resort amenities at The Cabana provide great spaces for relaxation and recreation. Highlights include a swimming pool, tot lot, lounging area, multi-purpose room, plus expansive lawn and outdoor dining areas with barbecues. A variety of restaurants, shops and entertainment are within walking distance from El Paseo. Homeowners have easy access to popular Southern California destinations via the nearby 241 Toll Road. El Paseo is also situated within the high-performing Saddleback Valley Unified School District. To visit El Paseo at the Village of Foothill Ranch from I-5, exit Bake Parkway and head east. Turn right on Portola Parkway, make your first right on Auto Center Drive and then turn right again on El Paseo. The Welcome House is located on your right and is open daily from 10 a.m. to 5 p.m. and Wednesdays from 2 p.m. to 5 p.m.
For more information on El Paseo, call 844.390.9523, or visit www.BrookfieldSoCal.com. Prices effective date of publication. Brookfield Residential Los Angeles is a premier lifestyle provider comprised of a dedicated, knowledgeable team of professionals with the passion and experience to craft exceptional new homes, neighborhoods and communities. From the goals of first time buyers to the prestige of luxury homes, we are proud to offer opportunities that embrace a diversity of aspirations. Respected as an award-winning innovator, we are recognized for delivering consistent quality, design details and an outstanding customer experience. Please visit www.BrookfieldSoCal.com for more information. Brookfield Residential Properties Inc. is a leading North American land developer and homebuilder with operations in eleven major markets. We entitle and develop land to create master-planned communities and build and sell lots to third-party builders, as well as to our own homebuilding division. We also participate in selected, strategic real estate opportunities, including infill projects, mixed-use developments, infrastructure projects, and joint ventures. Brookfield Residential is listed on the NYSE and TSX under the symbol BRP. For more information, visit www.BrookfieldRP.com. With no Mello-Roos fees and attainable pricing, renters are moving up to new homeownership opportunities at El Paseo.